Every issue contains the best of local and national news, entertainment, sports, as well as your complete TV guide and much more! Note: If you are renewing, write “Renewal” in the order notes in the cart. Our system will automatically detect renewals regardless. 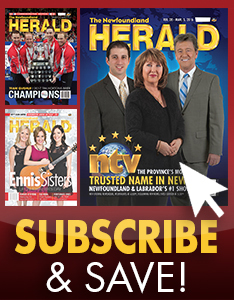 Newfoundland and Labrador’s weekly magazine bringing you the latest news on politics, entertainment, events and everything in between not only on a local level, but nationally and internationally as well.